This lovely clear stamp features a main image of two very cute owls and also includes two small heart stamps and four sentiment stamps. 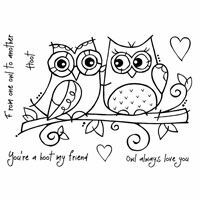 The sentiments are applicable to love and friendship making it a perfect stamp for Valentines, weddings, anniversries and general friendship cards and scrapbook layouts. 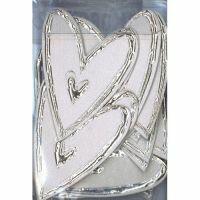 These high quality polymer stamps are ready to mount on an acrylic block, stamp size (14 x 8.9cm) 5.5 x 3.5 inches.